CANBERRA—Last Sunday, Filipinos heard for the first time in 40 years the late President Ferdinand Marcos’ TV speech declaring martial law in September 1972, the beginning of a brutal dictatorship that ruled the country for 14 years. “The speech [is] a very nice resource for [the public] to understand and be aware of what happened in those times,” said the spokesperson. The replay reflected the official perspective that highlighted the human rights abuses of the dictatorship from the point of view of the victims, especially the President’s family. The memories of martial law of the nonelite on the ground are far different from those of the middle class and members of the socioeconomic oligarchy (to which the Aquino family belongs), who were locked in a struggle for power with the Marcos regime. What was happening on the ground when Marcos declared martial law? From this vantage, the view is that Marcos began dismantling Philippine democracy with a fraudulent proclamation. Marcos falsified the date of the document that wiped out by decree the constitutional democracy established with the inauguration of the Philippine Republic in 1946. He signed the postdated martial law proclamation on Sept. 21, 1972, a Thursday, but announced it two days later. 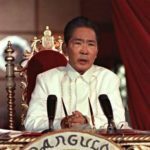 When he appeared on TV at 7:15 p.m. on Sept. 23, a Saturday, to announce the proclamation of martial law, the announcement was anticlimactic. The implementation of the proclamation had begun hours earlier—at midnight of Sept. 22, a Friday. The first wave of arrests of 200 target personalities, including opposition figures and newspapermen critical of the Marcos regime, began on Friday evening. The arrest orders were prepared weeks ahead of the announcement. Backed by the military, Marcos swiftly dismantled the entire infrastructure of civil government within hours of announcing on national television that he had signed Proclamation No. 1081 placing the entire country under martial law to save the Republic from the communist New People’s Army, the private armies of the provincial warlords of the Right, the activist students linked to the Left and to the middle-class clerico-fascists in the universities, and the oligarchic families who owned newspapers and radio-TV networks which had relentlessly attacked corruption in his administration. The preparations for martial law, which began in utmost secrecy in January 1970, within the first few months of his second term, shocked and disarmed the nation so completely that it left no chance for the administration’s opponents to organize a resistance. On Friday evening, military contingents had appeared at newspaper offices and TV-radio stations, to padlock them and to nail on their doors copies of Proclamation 1081. In his diaries, which came to light after his dictatorship was toppled by the People Power Revolution in 1986, Marcos gloated over the swift and bloodless dismantling of the 26-year-old Philippine democracy, Asia’s first in the post-World War II years. According to Marcos’ diaries, in the first round of raids 52 persons out of 200 on the target list, including Sen. Benigno “Ninoy” Aquino Jr., the father of President Aquino, were arrested. The 52 were only the tip of the iceberg. They were made up of high-profile, middle-class opponents who bore the brunt of the mailed fist of an unfolding dictatorship, which was inspired by the successful imposition of authoritarian rule in Singapore and South Korea. The list did not include the leftist armed insurgents who had gone underground months before the proclamation. The declaration of martial law was not entirely unexpected in the media. The preparations for the imposition of martial law were the worst-kept state secret. Media offices were awash in reports or rumors of the inevitability of martial law; among newspapermen who covered the political and Malacañang beats, the question was no longer whether martial law would be declared, but when. Before midnight of Sept. 22, after we had put the last edition of the Chronicle to bed, I received a phone call from a close friend, Johnny Araneta, at home in Blue Ridge, Quezon City. He said Marcos’ defense secretary, Juan Ponce Enrile, had been ambushed near Wack Wack Golf and Country Club. “That’s it, that’s all over now,” I told myself. After the phone call, I immediately rang the graveyard shift at the Chronicle newsroom. No one answered. I switched on the radio and TV. They were all dead. The next time radio-TV came back, it was Marcos announcing the demise of Philippine democracy. Proclamation 1081 opened the long era of a non-elected New Society that was toppled by the People Power Revolution in 1986. When Marcos appeared on TV, strange things were taking place. His announcement was made against the background of martial music, reminiscent of the Horst Wessel Song of Hitler’s Nazi Party in the 1930s.